Modern astronomers are detecting patterns in the outer planets which suggest the presence of another planet in our solar system. The technology we have today allows us to view events described by the ancients in a new perspective. This section contains a vast amount of information relating to the theory of "Ancient Astronauts". This information poses an interesting Hypothesis that the "Annunaki" are the GODS as described by the Sumerians, and they had "Android Beings" helping them. Recent advances in DNA confirm the Sumerian stories of creation, which have filtered through to our modern understanding of "Where we come from...."
Watch this video of revealing information on human origins and the possible locations for the lost atlantian civilization. Listen to the full audio book version of the 12th planet by Zecharia Sitchin. Learn about the 40 years of amazing research by this man, starting with his first book. 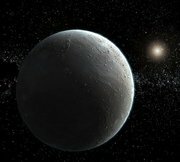 NASA FINDS ANOTHER PLANETOID "XENA"
NASA announced the discovery of a "tenth" planet in our Solar system, but as they have done before, this is just another Sedna type object. Nothing close to the Ancient Nibiru. The discovery of a mysterious object in our solar system is the topic of a news briefing on Monday, March 15. This object does not appear to be large enough to fit the "planet X" scenario. This show took place on November 19th, 2003 where I discussed the Sumerian Astronomical evidence. As well as the Sumerian knowledge of the Anunnaki. Here is the largest collection of Sumerian artifacts online. More data has just arrived from the British museum. PYRAMIDS DATED TO 10,000 B.C. An interview with John Anthony West and others on the real age of the sphinx and pyramids in Egypt. Here is a recent interview with Zecharia Sitchin discussing his research into the Anunnaki and the planet Nibiru. Modern Scholars are still baffled by Sitchin's information. FAMOUS MADONNA PAINTING SHOWS "UFO"
Above Mary's right shoulder is a disk shaped object. Below is a blow up of this section and a man and his dog can clearly be seen looking up at the object. Learn about the Sumerian culture from 4,000 B.C. and see the actual evidence and artifacts from a time when man lived amongst his living gods!